For those coming late to this short series, I’ve been catching up on my fiction reading which, unfortunately, led to an unexpected amount of eye-rolling. The problems I’m covering should never have made it to an editor, never mind to print. They should have been noticed by the author during the writing and corrected. It is the author’s name on the cover; it is the author’s responsibility. Seeding information: the strategic sowing of teaser information into earlier parts of the storyline so that when a pertinent plot point later occurs it does not occur against the flow of established logic. • A crack appears in the pavement; still liquid shivers in an open container; a whiff of rotten eggs emanates from a manhole cover >>> a seismic event occurs, natural or man-made depending on the storyline. • A young girl is taught the rudiments of boxing by her grandfather; she enjoys sports at school; she takes up karate as a teen >>> she lays out the street robber attempting to steal her bag. What lessons? Since when had he wanted to become a pilot? More like since the author needed to plug a hole in the plot and couldn’t be bothered to backtrack in the storyline to set up a thread to sustain the character’s ability to take the controls of a plane. Laughable? I’d like to say the above is an extreme example, but a couple I came across in my reading weren’t far behind. This lack of cause to enact the effect stems from a scarcity of detail in the outline of both the character and the storyline. I write organically so have never been a fan of planning a novel down to scene level before starting on Chapter One, but there needs to be a skeleton of a storyline from which to pick the plot elements, and that is built from the characters, particularly the protagonist. Bulking out of flesh, either before starting or during the writing, comes from brainstorming the characters and the storyline simultaneously. An infodump, no matter a page or single sentence in length, won’t plug a hole in the storyline or cover up cracks in characterisation because it takes no account of the importance of pacing in a novel. 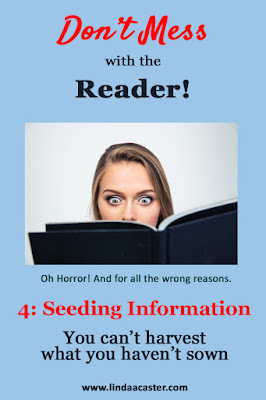 I used three information teasers in the examples at the top of this post; in a novel there would be many more and they would be seeded with subtlety. The reader should hardly notice a backstory being built, but when the conveyed information becomes pertinent to the unfolding storyline, it’s a natural fit due to cause and effect. You can’t harvest what you haven’t seeded.